The production of maple syrup, or sugaring, hasn't changed much since the time of the Native Americans. Maple syrup comes from the boiled down sap of the sugar maple tree. Each year in early spring, maple producers, also called "sugarmakers," head to their woods for the start of maple syrup season which generally lasts from mid-February to early April. Maple producers "tap," or drill a small hole into the trunk of a tree and then insert a spout or spile to catch the sap that begins to collect in the hole. 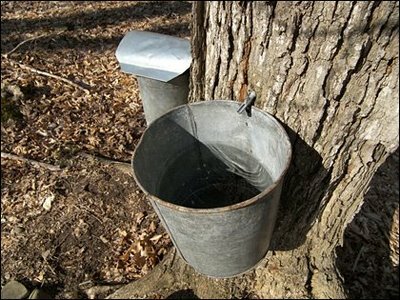 The spout is then be connected to a bucket, or to plastic tubing stretching through the woods, to collect the dripping sap. thermometer calibrated to at least 230 degrees F.
Find one or more maple trees. Be sure to select trees that are at least 10 inches in diameter and 4 1/2 feet above ground. Drill a 7/16 inch diameter hole in the trunk, two or three inches deep. Really large trees can have two or three taps. Clean any loose wood out of the hole and lightly tap a spile into it with a hammer. Hang a clean, rust-proof bucket, can, or plastic milk jug from the spile to catch the sap as it drips out. A container with a lid will help keep rain water from diluting the sap and will also keep bits of bark, insects, etc. from falling into the sap. When the containers begin to fill, the sap should be collected and refrigerated until you are ready to boil it down to syrup. Boil the sap in a large stainless steel pot or pan, preferably outdoors so steam will not cause problems. Take the temperature of the sap when it first comes to a boil. This will help you know when it is finished syrup. The faster the sap is boiled, the higher the quality of the syrup. The syrup will have the right concentration of sugar when it is 7 degrees Fahrenheit hotter than when it first boiled. At or near sea level, the temperature will be about 219 degrees for finished syrup. Keep a close eye on the sap as it nears this point to keep it from scorching or boiling over. A bit of butter or margarine rubbed at the top rim of the boiling pan will often keep it from boiling over. Strain the finished syrup through clean cheesecloth or a food-approved filter to remove any bits of debris, as well as any crystalized minerals.